A modern skyscraper located in mid-town Manhattan, 4 Times Square is the 12th tallest building in New York City, with 48 stories. Home to mega-publishing company, Conde Nast, 4 Times Square has 1,600,000 square feet of office space. Between 2002 and 2003, the building’s radio Antenna was removed and replaced, with a three-tiered 300 foot mast to support Television and Radio Broadcasters, as a primary or back-up transmission site. 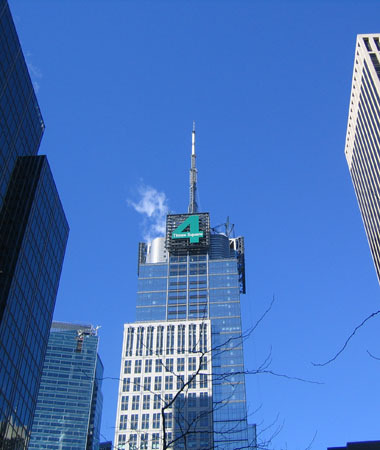 Working directly for Motorola, WNYC and other such broadcast tenants, Hatzel & Buehler installed broadcast transmission lines and transmitter equipment, located in the iconic Manhattan building. Once installed, Hatzel & Buehler also supported the testing and tuning of the transmission equipment.